From what we all read and hear, route density is the most important driver of low cost in the shredding industry. However, this is not true. While route density is important, what matters far more is your “Revenue and Profit per Truck.” Revenue per truck in the shredding industry ranges from under $100,000 to more than $250,000. Wherever your operation is along this continuum, driving for extra “revenue and profit per truck” belongs at the top of your to do list. Measuring these variables is easy. You should calculate these metrics by month. If your graph looks like the Sawtooth Mountains, it’s a clear sign of an unmanaged metric. If your graph shows steady progress, congratulations. Is Every Truck a Profit Center in Your Financial Reporting? 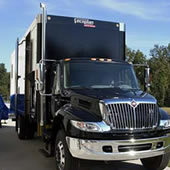 Dean Buntrock, a founder of Waste Management, developed a bedrock business principle: “Every truck is a profit center”. Today Waste Management sales exceed $14 billion. In a related matter, Buntrock built on the concept that “at the center of every truck is a driver.” Rewarding drivers based on performance and safety makes economic sense, since it’s impossible to have an efficient transportation system without them. Because drivers are the face of your company for all of your customers they are, in addition, in a unique position to create great customer relationships and boost sales. Having extra security bins or consoles with each outbound truck gives drivers just one additional way they can boost sales. Just don’t forget the basic principle: What gets recognized and rewarded, is what gets done. If you want to get drivers to drive sales as well as trucks, then provide incentives for a new bin placement to compensation. You’ll also improve your chances of getting the paperwork done right. It’s almost unbelievable that national shredding companies charge minimum rates per stop of approximately $150 while many independent companies struggle to get $89. At seven stops per day at $150 minimum, revenue is $1,050 per day or $273,000 per year, but at $89, those same 7 stops per day produce annual revenue of $162,000. More than $100,000 difference over the course of a year. Who’s priced right? Now is always a good time to check out the competition. Sam Walton, for example, was highly disciplined about checking his competition. 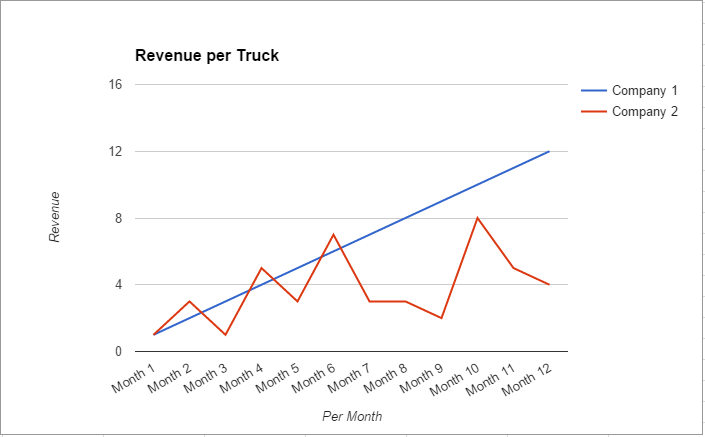 The person with the lowest revenue per truck may be the person you see in the mirror. Low revenue per truck may simply reflect that you don’t charge enough. Clearly a route with 1 mile between stops is preferable to one with 10 miles between stops. Making 3 pickups in the same building is even better. It’s why route density is a key metric in generating profit. A focused sales effort creates route density – every office in a building, every business in a business park, etc. Just don’t forget the basics – what gets recognized and rewarded, is what gets done. Even a $5 “proximity reward” will get results and boost revenue per truck, and don’t forget to include drivers. Using marketing services that create referrals for specific zip codes (i.e. Shred Nations) can help significantly in creating route density. Feel free to ask us how. Build your business near your center of operations/ in your local neighborhood. This also helps avoid the major irritation of seeing your competitor’s trucks out of your office window. Build your business along transportation corridors your trucks routinely use. Use marketing services that create referrals with a geographical focus – such as using Shred Nations, a service that connects buyers of shredding services to shredding companies based on specific zip codes (i.e. service area). For the most part revenue is produced at stops. Arrange to create efficiency and sufficient revenue to earn adequate daily revenue for the truck. If practical, have customers bring materials for shredding to the truck dock on the day of pick-up. Yet, if the customer is willing to pay the right price, you can go in the opposite direction and offer to take boxes out of the storage racks under the direction and supervision of customer. Either strategy can add to revenue per truck. Create concentric circles on a map from your center of operations at 5 miles, 10, miles and 20 miles. Then divide the areas along transportation corridors. Schedule areas for different days of the week and then slot new customers into their appropriate pick-up day. Based on traffic and timing it typically makes sense to go to the most distant stops first to avoid the morning rush hour. Then by working each route back towards the center of operations, cost is minimized. Whether on purpose or because a customer underestimated the load, a truck must return to “base” at midday, it reduces cost. As the day goes on break-downs of one sort or another may occur and being nearer to base allows greater flexibility. Decisions . . . decisions. Using profitability information from the “profitability by truck” report is very helpful in deciding what drives profit in your business. Don’t forget to evaluate used trucks where you often can buy two used ones for the price of a new one. Engines, transmissions and wear parts, while expensive, wear out in both new and used trucks at about the same rate. For many “wear parts” new and used trucks require the same frequency of repairs. Shred Nations’ mission is to help independent shredding companies succeed. Our customers range from single shred-truck operators to regional shredding companies with professional, highly sophisticated managers. Shred Nations is, hands-down, the most effective, low cost way to get a direct flow of new customers. If you have any questions, please call (303) 653-2574 or email dpowelson@salesstarnetworks.com.